The Police in Ogun state have arrested three members of child – stealing syndicate; who steal children from unsuspecting parents. Temidayo Ajayi, one of the children recovered from the suspects was abducted with his brother in Sagamu July 2018. 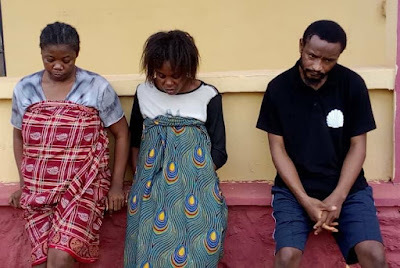 Abimbola, a Deputy Superintendent of Police (DSP), added that the anti-kidnapping/cultist unit who were given the mandate to crack the syndicate, embarked on high technical investigation which paid off when the principal suspect, one Mary Paul was tracked to Ondo State where she is on trial and remanded in prison custody. According to the Police spokesperson, following a synergy with the Ondo Command, relevant information was extracted, leading to the arrest of three other members of the gang directly involved in stealing of eight children across Ogun State. “Three out of those children were subsequently recovered from them.